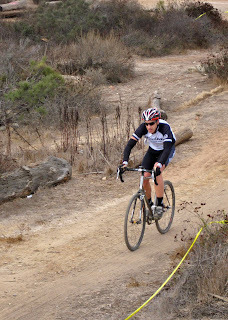 This past Sunday saw racing of my second (and last) cyclocross race of the season. 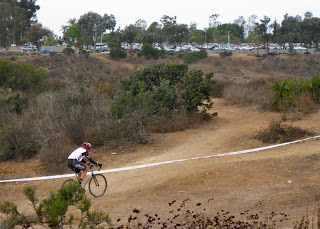 The SoCalCross Prestige Series had a couple of events down here in San Diego County this year - Storm the Beach at Camp Pendleton in November and Cyclocross at the Velodrome this past weekend in San Diego's beautiful Balboa Park. I had thoroughly enjoyed thrashing body and bicycle during the 45 minute race back in November, so the grrrls and I drove on down to the park. Ordinarily cyclocross races are held in dreadful weather - mud, rain, sleet and snow. This being San Diego, I didn't expect to see any sort of inclement weather. With temps the low 60s accompanied by a stiff breeze and overcast skies, at least there was some chill in the air. Ironically I did overhear one guy say "now this is cyclocross weather". I guess it's all relative. The course was laid out over singletrack and fireroad that had both sharp and rocky as well as washed-out sandy sections. Additionally the organizers put in a "spiral of death" - a decreasing-radius turn on soft, slippery grass. Overall, a very fun venue. Celeste has been having fun trying out her new digital camcorder (thanks Dean) and captured a couple of snippets of me. Excuse the shakiness, she was rattling a cowbell and some jingle bells. For some reason I wasn't really all that amped up at the start. My heart was racing at 100 BPM as we waited for the starting pistol and I managed to let a decent-size group of guys ahead of me. I hadn't done a recon loop, so I didn't know the course and decided to follow along for at least the first quarter of the first lap while everyone found their race pace. 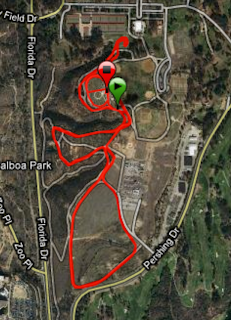 I started picking away at the field, passing some solo guys and some groups of 5-6 riders. ...but settled into a groove and turned up the speed to pass even more racers. Happily I didn't get passed once by anyone in my race - but the top Cat 1 woman (pro mountain biker Pua Sawicki) manged to reel me in on the third or fourth of five laps. A number of fellow racers suffered from flat tires from the rugged course while the Gunnar just chugged along underneath me while I enjoyed the springy feel of the bike's cro-moly tubeset. 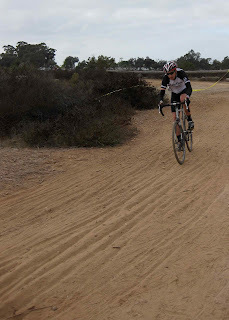 The highlight of the race was the finish on the San Diego velodrome. Laid out in a manner where you entered the track high and completed two total laps prior to reaching the finish line. Not sure of my finish, but Allie thinks I was somewhere just outside of the top ten in the men's 3/4 open. Another good day on the bike.